Think before the interview if possible how you may showcase the talents for the specific job. for all not only from those who have good communication skills. Is there a bias your style of interview approach more towards those who have good communication skills? If the job is in hospitality and requires clearing tables/ carrying trays/pouring etc. may be this needs to be the basis of the interview. If the job is about accuracy and data analysis but is not ‘customer facing’ then an interview panel may not be the best setting to showcase the talents. An interview process for most of us can be nerve wracking but for someone for example with communication or social skills difficulties, it may be even more challenging. Even before you get to the interview…. 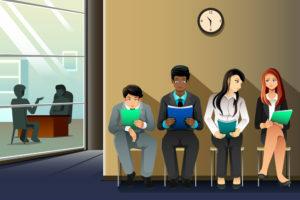 Even before the interview the person may have had to travel to a new location, and think about what to wear, and ensure they have the right documentation with them. They may also have had unsuccessful experiences on several occasions previously and so be recalling this as they arrive at the interview. All this may skew their behaviour before they start. Small changes can mean the person presents themselves badly even though they could have been the best person for the job! – Starting and having to maintain conversations and understand when they have been finished so not to interrupt someone. – Trying to sound friendly but not over familiar, but also not too formal. All of the above for some people may be really problematic! Think about what will really showcase skills needed for the job itself. Provide information when it will happen and where it will happen with enough time for someone to do a ‘dry run’ and travel to the building and familiarise themselves with the area. Provide a map and visual clues on how to get the building. Give relevant transport information options e.g. bus/train/road. When providing tasks for the person consider that for some, an open-ended problem-solving task may be useful to see how people go about a task, but for others this type of task, with neither a ‘right nor wrong ‘ approach, may be potentially troubling at the least and cause deep concern and anxiety.